In the five floors of the Centre one can find an Auditorium with a capacity of 462 seats, a Conference Room (172 seats), two Galleries, Teaching and Rehearsal Rooms, a Board-room, a Refreshment Room, and a Library. The chief purpose of the Homerion Cultural Centre is the recognition and support of artistic and scientific trends which broaden the sensibility and the knowledge of the public and, at the same time, encourage it to seek quality in life. 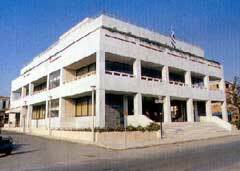 One of the Centre's aims, also, is the promotion of the cultural educational and scientific coordination between Chios and other cities. During the 1986-1995 period , 2.500 events took place in the Centre - film screenings, lectures, theatrical performances, paintings and photography exhibitions, teaching courses, concerts and dancing performances. The services and the facilities of the centre are available to the associations of the whole country for any cultural event of non profiteering purpose. 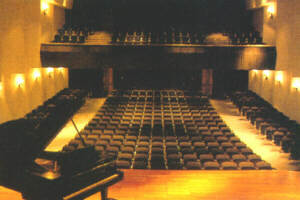 Seating 462 in stalls and dress circle, excellent acoustics, modern stage-installation, dressrooms and scenery-workshop. Also panoramic screen for film shows and projection-equipment for 35 and 16 mm films and slides. Equipped with "STEINWAY" piano. Up-to-date lighting system in stage and seating area suitable for every theatrical presentation. Supplemented by 300 sq.mt. and a bar. Equipped with simultaneous translation system in three languages and projectors. It can be used for lectures, conferences, teaching courses, slides-projections etc. 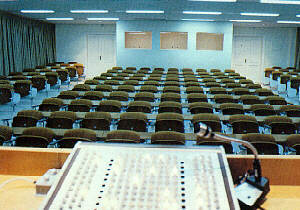 It also can be used for board-meetings and teaching courses. There is a 420 sq. mt. 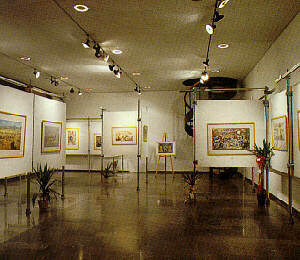 space in the first and ground floors and the first basement suitable for exhibitions: painting, sculpture, pottery, art etc. Equipped with escellent support frameworks and modern lighting systems.